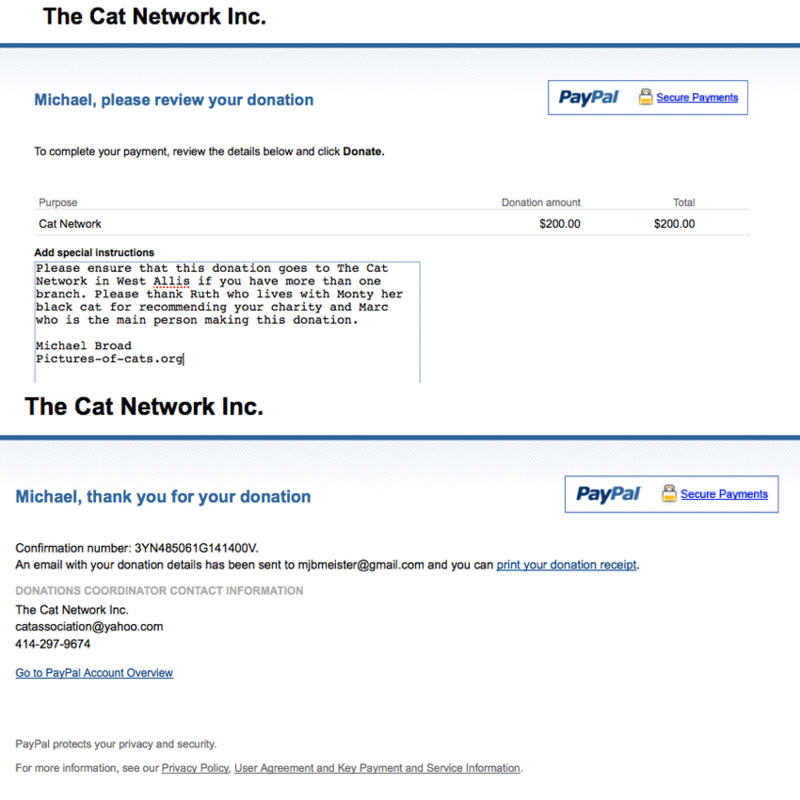 Donating $1000 to cat and animal charities. If you are new to this story please read this page first as it contains links to earlier posts. 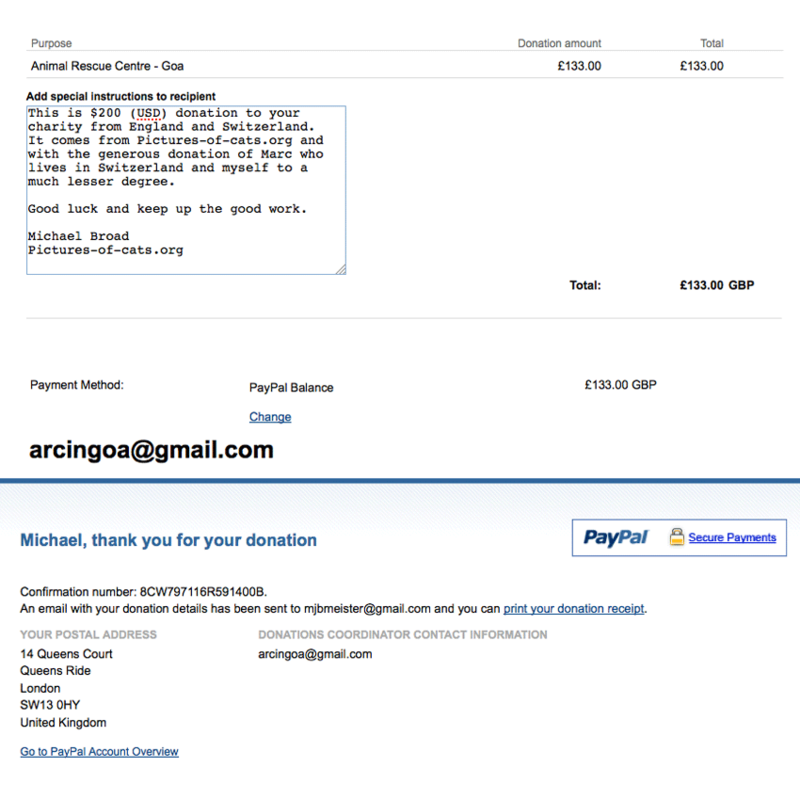 In summary Marc, a PoC regular, has made a very generous donation to world cat and animal charities in honour of a cat he loved: Red. Each of the five charities received $200 or currency equivalent as at exchange rates today, 5th July. $200 = £133 today. They change all the time. This page simply sets out evidence of payment through screenshots. There are four collage or combination images on this page that evidence payment to four of the five charities. I show (1) the payment message before actually making the payment and (2) the confirmation of payment afterwards. The fifth charity to receive a donation is Kays Hill Animal Sanctuary. They are being paid by cheque because they don’t have a PayPal account. I am dealing with that separately and will update the page once payment has been confirmed. I’ll be in touch with Kattaddorra about the Kays Hill payment because I want to make sure it is done properly. So many thanks to all and particularly Marc and our love to Red who inspired Marc. 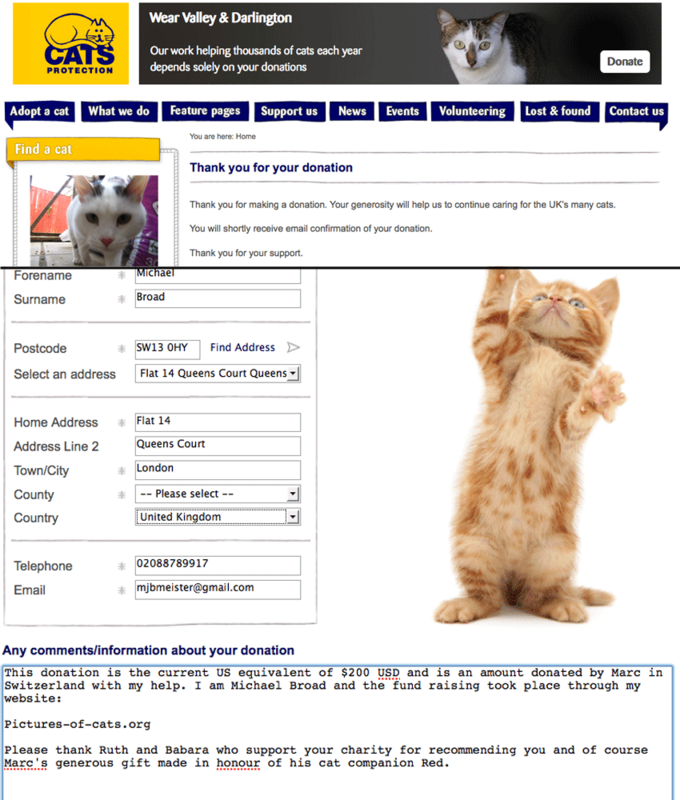 We made the donation to Kays Hill by buying cat food from Amazon You can see the confirmation below. Delivery is to Ruth and Barbara. Why? It is a more certain way of proceeding and the address is on my Amazon account. It’s about predictability. This entry was posted in ailurophile, Animal Rescue, Cat shelters, Charity, Human to cat relationship and tagged cat charities, charitable donations, PoC donations by Michael Broad. Bookmark the permalink. Thank you very much for making a One Off Payment of £133.00 to Wear Valley & Darlington; your generosity will allow us to help cat after cat! Please check your Gift Aid status below. If you wish to change your status, please contact us. Just wanted to thank you for your donation especially now during monsoon when things are very difficult. $200 will pay for the vet assistants salary for one month!! Thank you so very much, from the bottom of my heart. Because of you we were able to take Popcorn (a pregnant black cat rescued when left behind at a closed trailer park several years ago) to the vet for a severe infection in & behind her ear. Great to hear from you Joyce. So pleased that the money went direct to a cat in need. That makes me feel good and I am sure the rest of the gang feel the same way. Take care. Joyce, I am so glad Marc and Michael from PoC were able to help you. I read your Facebook posts and I know your need is great, but I have not been in a position financially to help lately, but I (and Elisa Black Taylor) recommended Warmfuzzy’s. You work so hard to help cats in need. I know Facebook can be less than supportive of those trying to help animals in need through their posts, but keep posting. It does help. I live in Wisconsin and would never have known about your shelter any other way, much less Marc in Switzerland or Michael in England. When our checks start to come in from all the fireworks shows my husband and I worked I’m hoping I can send you something then. Lately if I have a little cash I drop it in the jar at the Cat Network. It’s easier to help local organizations in many ways, but the miracle of the Internet is really making it possible for us to do more for those beyond our neighborhood. PoC feels like a neighborhood, where we all gather on somebody’s virtual front porch in the shade and talk about cats. Marc really went above and beyond by getting up out of his virtual rocking chair on that imaginary front porch and reaching out across the globe to help cats in distant places. Wow. I was thinking next year we could do a fund raiser in Red’s memory. We could all make a difference. Great job gents. Nice idea. Thanks Dan. I think we should make it annual. That was Marc’s suggestion and I like it. This is all very nice – I see a big group of us being kind to eachother and cats and we have raised money to donate to charity together all of us (I couldn’t have done it without you all) and I am certain of one thing – that I want to do the same thing again next year because it feels right in many ways and because it actually helps cats in many ways in many places and also because I can manage without the money one way or another, and I have an advance warning this time so I can actually save up for next year so it won’t even make a dent in what my cats and me need every month. I have to thank all of you for commenting and your enthusiasm and for providing charities and ideas and for being kind, and I have to thank Michael for creating the world in which all this is happening. PoC and you all have helped me alot as you know. I know I talk alot about Red – it seems somehow that I can relate or understand so many things in terms of him and especially on a cat site where we talk about cats obviously. I think for all of this we which have done together and what it will do for cats and the great thing this has been, I have to thank Red. He made such an enormous impression on my life and it’s as clear as the light of day that he still does. This has added joy to the bittersweet story of Red and me – in his name. Simply put, Red has done this. PS: I think Ruth and Babz kept a little for Jo and Walt – originally this was to thank all of you for helping me. PPS: I think it’s quite fitting also that I now have a net around my balcony and it’s become a catio – this is my response in dealing with what happened to Red so it doesn’t happen again. Far from ideal but it will be a nice place with lots of plants. I will send Michael photos once it’s got some life in it – I want it to be full of plants and greenery I was even thinking about getting a very large 1 meter by 2 metre low flat container and putting turf/grass including cat grass in it. I have lots of cat grass seeds too. Then they could roll around on it and eat it up and vomit 🙂 I bring them fresh long grass and weeds everyday now and throw it on the floor for them to play with and they love it. It smells so like the earth and green – something I want them to have lots of. Marc, I can genuinely say that Red made an impression on me too. I believe that applies to the PoCers and visitors. The Red Memorial donations are a special moment for PoC, the website. The memorial page will be one of five or so pages amongst 8000 that I will never forget. Hi Marc, it’s very kind of you but we certainly won’t keep any for our Walt and Jo, every last tin will go to Kays Hill cats, our boyz are well provided for, their food cupboard is fuller than ours lol and if they get sick of any sort as cats sometimes do, that goes to needy cats too. When the food comes we will take one of it and also of Kevin or Leanne when they come, if they will agree. I’ve written the article about Marion CP and sent it to Michael but Leanne said yesterday she would write theirs herself, which is even better than me doing it. THANK YOU again from all the cats in care here your wonderful generosity. I meant take a photo of course lol I think I’d better go and have something to eat and a rest, my brain hurts lol it’s been a long hot day. We can have both yours and Marion’s 😉 We love to promote good people, success stories, and improved welfare for cats. Thanks again Ruth for your excellent article. Keep talking about Red all you want, Marc! My late husband’s mother says that if we stop talking about those we have lost then it could become like they never lived. The best thing is to keep those memories alive, but not comparing one cat to another because Red was special, but your other cats are equally special, in their own unique ways. Red lived, he was here. Honor his memory by talking about him. I talk about my late husband, but I don’t compare one husband to another. That would be wrong. But to just stop talking about someone as if he never lived– my late husband’s mother is right. We do no one a service by pretending someone never lived. Grief is a part of life that can be shared and eventually the grief fades and you are left just with the memories. Thanks very much for this, as soon as it comes we’ll let you all know and alert Kays Hill to come and collect it, then we’ll put some photos on here. I wondered how the cats would get the donation when it’s a mixed animal sanctuary,what a great idea to send it in food. Very good point Rose and something I didn’t even think of but very important. Dogs have more support I believe which is why I am here for cats specifically. your generous donation! Very much appreciated. Thanks to Ruth and Monty! What an excellent result and worthy tribute to Red that five charities will benefit from Marc and Michaels generosity, so proud of PoC and Pocers! The cats will appreciate that very much! 🙂 Will try to get a photo up there when we take it up. and DON’T worry, when I do something for a neighbor’s cat, I always let them know what I’ve done, as far as AdvantixII/frontlining, and so forth. Oh yes you must tell them Caroline because if they didn’t know and used some chemical flea stuff too the cat could become ill with the double dose…or even die …..better still ask them first, to make sure. I’m sure you know this but also always check the expiry date on any treatment at all for cats, out of date stuff can be lethal! …written by Elisa and FB “like it” to spread the word about our work for cat welfare. The more that know the more we can continue to help cats through PoC and our team. Good. Pleased. It is all for the cat and what you did has ripples. I hope you find this page OK, Marc. I think with a decent amount of money at stake we have to be completely transparent (unlike governments ;)) – I feel very strongly about that. PoC has got to be seen as genuine which is very much is. Great, very appropriate to spend it on the cats, I think they’ll have to come and collect it though, don’t think Ruth and I (or our old car) are fit to shift so much at once, thank you SO MUCH! This is so wonderful for those charities! I’ve emailed you with a suggestion re Kays Hill, Michael. Thanks Ruth. We are working on that. 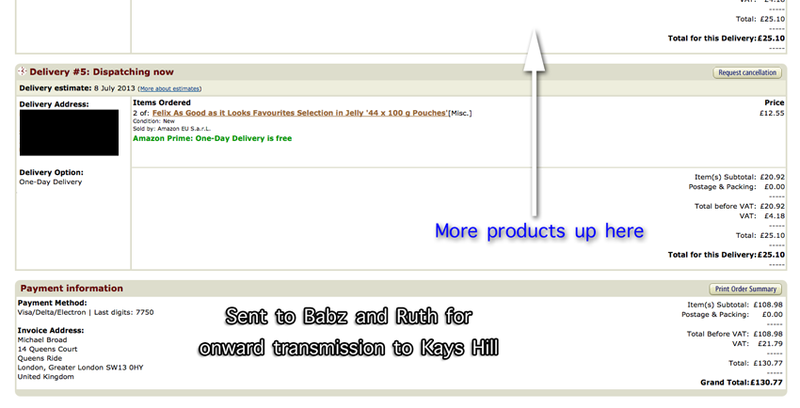 I have updated the page to show purchase of cat food and delivery to you and Babz for onward transmission to Kays Hill. Please confirm delivery when it happens.